“Green gold.” That’s the new name Mexicans have given to avocado, one of the country’s staple foods and most important agricultural exports. Unlike real gold, the price of green gold is soaring, having more than doubled in the last year alone, to reach an average price of 71.4 pesos ($3.85) in Mexico City, according to data from Mexico’s National Institute of Statistics and Geography (Inegi). Avocado prices are soaring for a whole variety of reasons, including rising global demand. Mexico is the world’s biggest exporter of avocado, accounting for just under half of the global market. And that market is growing by the day, particularly in the U.S., Europe, and China. But there’s another reason why the price of green gold is rising in Mexico, and it’s much closer to home: inflation. 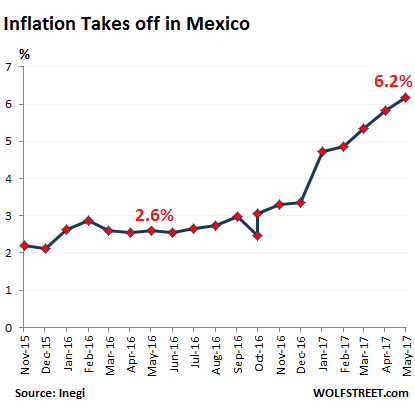 After decades of trying to tame the tempest of rising prices, with a reasonable degree of success, Mexico’s inflation rate soared to 6.17% in May, as measured by the INPC, the CPI version used by Inegi. It was fueled largely by the rising cost of food and energy after the government hiked gasoline prices by almost one-fifth at the beginning of the year. It’s the highest inflation rate since April 2009 and over double the Bank of Mexico’s benchmark rate of 3%.